You take pictures of all your special moments and milestones. 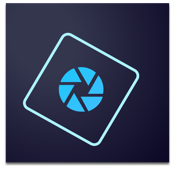 Adobe Photoshop Elements 15 automates the organizing and editing so you can have fun creating and sharing your amazing photos. • Organize — It’s easier than ever to find photos by the people in them, the places they were taken and the events they depict. And now you can even find photos based on subjects like sunsets, birthdays, cats, dogs, and more. • Edit — Make any snapshot extra-special with everything from one-click fixes to artistic looks. Photoshop Elements can guide you through or do it for you. • Create — Surround yourself with your memories by creating beautiful collages, calendars, scrapbook pages, and cards. ENHANCED Search is a cinch — Find the exact photos you’re looking for by searching on a combination of things, including people, places, events, and other favorite subjects. The Organizer is now touch-friendly. 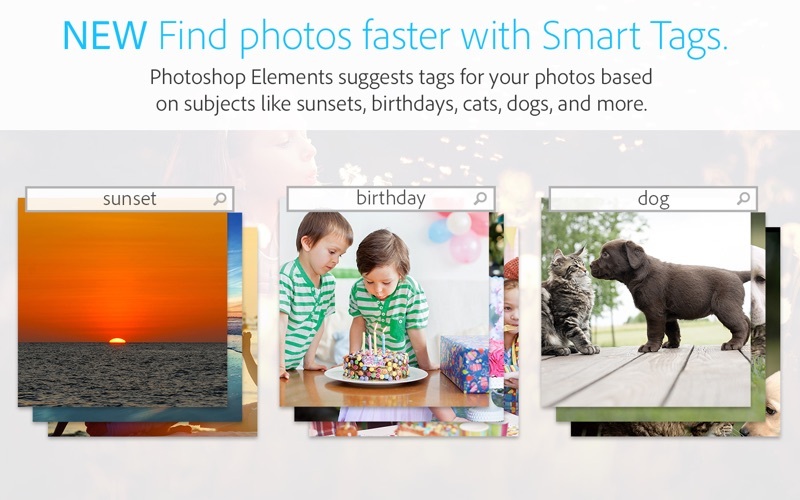 NEW Find photos faster with Smart Tags — Photoshop Elements suggests tags for your photos based on subjects like sunsets, birthdays, cats, dogs, and more. NEW Touch your way to great pics — The Organizer and Quick Edit mode are now touch-friendly, so you can tap and swipe to do all your finding, sorting, and quick photo enhancements. 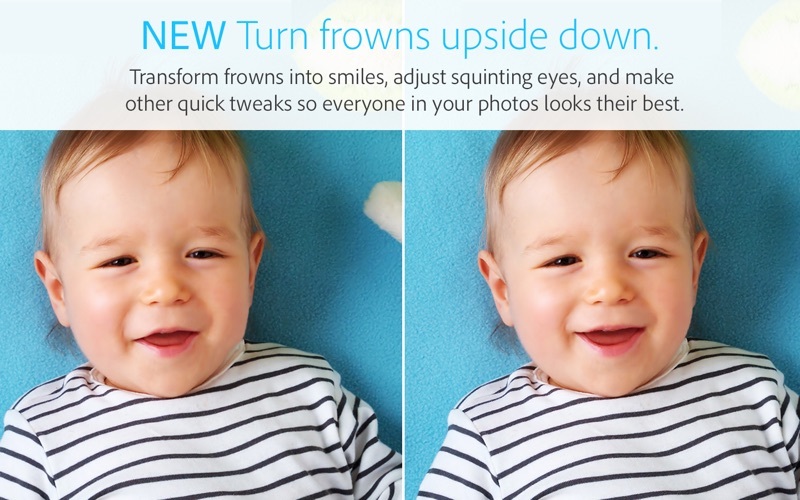 NEW Turn frowns upside down — Transform frowns into smiles, adjust squinting eyes, and make other quick tweaks. ENHANCED Guided Edits for help along the way — Guided Edits step you through to fantastic results. 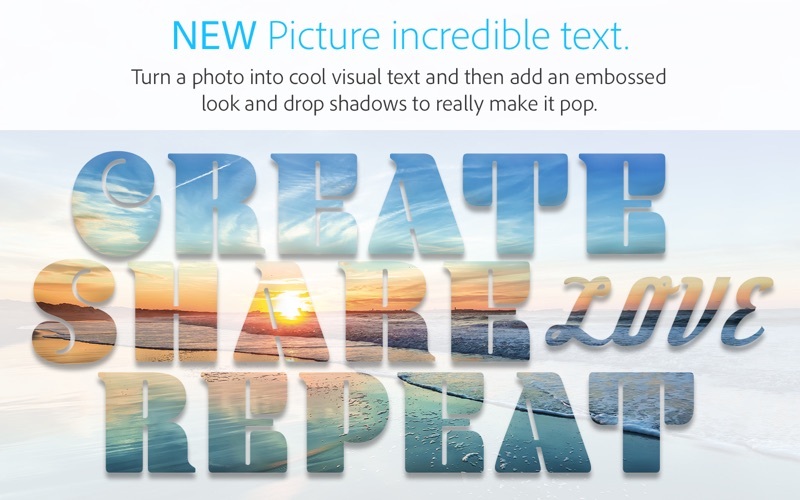 •	NEW Picture incredible text — Turn a photo into cool visual text and then add an embossed look and drop shadows to really make it pop. Great for collages, scrapbook pages, cards, signs, and more. 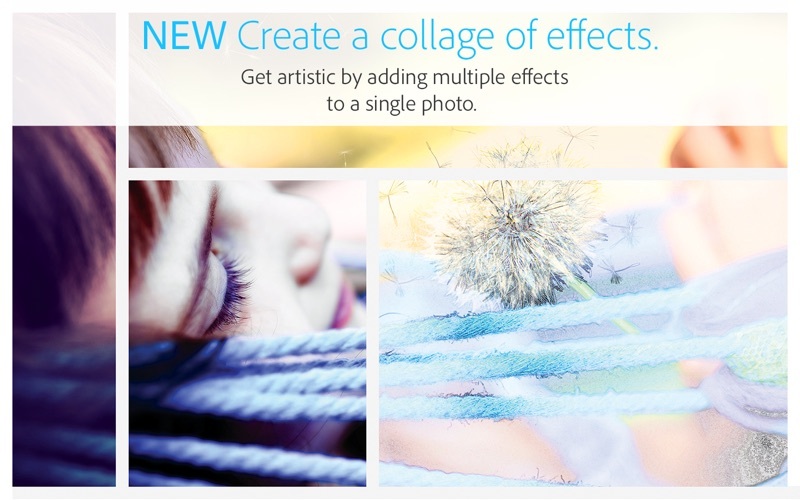 •	NEW Create a collage of effects — Get artistic by adding multiple effects to a single photo. •	NEW Pump up the action — Add a motion blur behind your subject to create a dramatic speed-pan action shot. 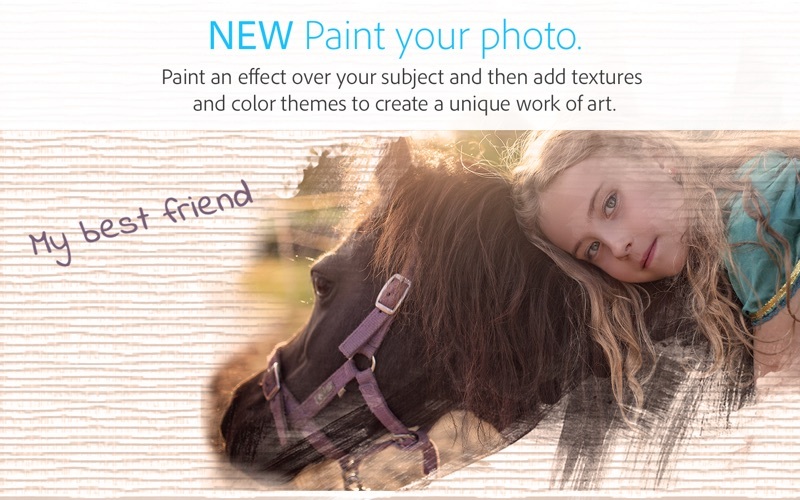 •	NEW Photo painting — Paint an effect over your subject and then add textures and color themes to create a unique work of art — perfect for sharing on social media or as a printed keepsake. •	NEW Truly custom frames — Create your own frames to complement favorite photos, add polish to your scrapbook pages, or share with others. ENHANCED Have more fun with filters — Now it’s even easier to choose the best filter for your photo and fine-tune the details. ENHANCED Fix photos by the batch — Edit a batch of photos at one time. ENHANCED Easier social sharing — Now, sharing to Facebook and YouTube feels just like being on those sites, so it’s faster and easier than ever. ENHANCED The right tutorials, right away — Get the help you need — even if you don’t know exactly how to describe it — right from eLive within Photoshop Elements. This free update resolves the crash upon launch problem. Thank you to everyone who reported the issue.